Your cries have been heard, Browncoats! Straight out of the Firefly universe comes Tall Card! With rules and artwork inspired by the game played on Firefly, Tall Card will make you feel like you're a fellow crew member aboard the Serenity! 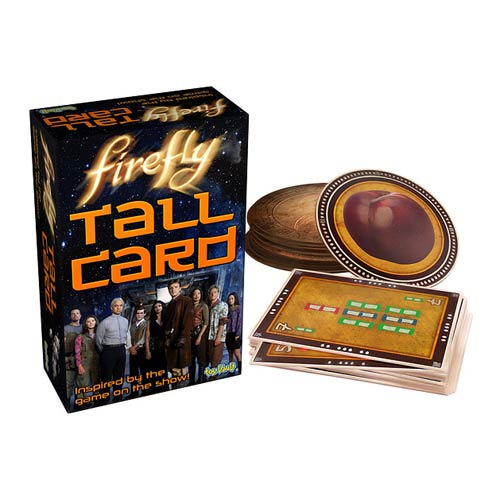 Each box includes over 45 cards, including the round "Tall Cards" as seen on Firefly! Also included are more than 50 additional cards so you can create your own games and pass the hours away as you drift from planet to planet. Whether you're just looking to kill some time between jobs or you're hoping to trade off some chores, the Firefly Tall Card Game is a must-own for any die-hard Firefly fan! For ages 14 years and up.